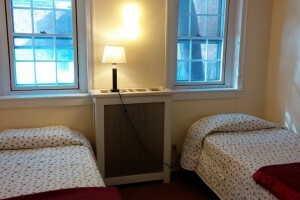 Beacon Hill Friends House has two guest rooms available for those who would like to share in our community during their stay in Boston. Guests have access to a fully equipped kitchen, a library full of comfy chairs and floor-to-ceiling bookshelves, a parlor with a grand piano, and two secluded courtyards behind the house. Self-serve breakfast is included free with each night’s stay, and guests may join us for house dinner (Monday-Thursday at 6:30) for $8. The Mary Dyer Room is named after a tenacious Boston Quaker who refused to stop preaching even after the Puritans forced her out of the city. This sunny room with a double bed is on the second floor near the library, overlooking the quiet, tree-lined street. For an extra guest, a single-size trundle bed can be set up on the floor. The George Fox Room is named after the passionate founder of Quakerism. This cozy room has two single beds, and is tucked into the quiet back of the house, with two windows that look out onto the kitchen courtyard. For extra guests, there is a futon in the adjoining childcare room. Both rooms have a desk and chair, lamps, and storage space for clothes and other belongings. Bathrooms are shared with the house’s permanent residents, and all linens are provided. Getting Here, and Getting Around Our house is a five-minute walk from Park Street Station, which is a hub of the T (Boston’s metro system). Two stops on the Red Line take you to South Station (the main bus and train station), where you can also connect to the airport via the Silver Line. There is no public parking in Beacon Hill, but there is a garage under Boston Common (if you are planning on using the garage, ask us about getting an overnight voucher). For a preview of room availability, check our Google calendar below. The Mary Dyer room appears in pink, and the George Fox room appears in yellow. If a day is marked as busy, it means there is a reservation for that night. For further information, feel free to take a look at our Guest Information Booklet. 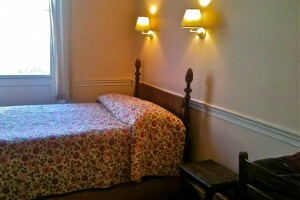 To make a reservation, write to the Residency Manager at hospitality@bhfh.org, or call (617) 227-9118. We hope to see you here in Boston soon!